Since 1989, when Ricky Boscarino stumbled upon the cabin in the woods and began transforming it into Luna Parc, it has been a massive work in progress. 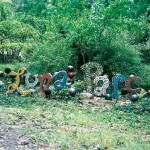 As rural as Philly is urban, Montague, New Jersey is where we found Luna Parc nestled in the woods. 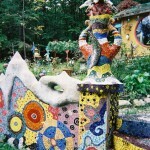 It’s another prime piece of mosaic magic complete with recycled sculptures throughout, all crafted by Ricky Boscarino. His arch o’ trophies, crutch collection and a memorial to his late pot-bellied pig peek out through the trees. Luna Parc is even more magical when he lights it at night. The fact that he attended art school (a prestigious one at that) didn’t faze us a bit. No way did they teach King Ricky to do this! 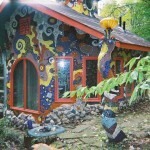 Filled with mosaics influenced by Klimt, Gaudí and Hundertwasser, the house looks as if it had been plucked from some colorful dreamscape and deposited in the backwoods of New Jersey. 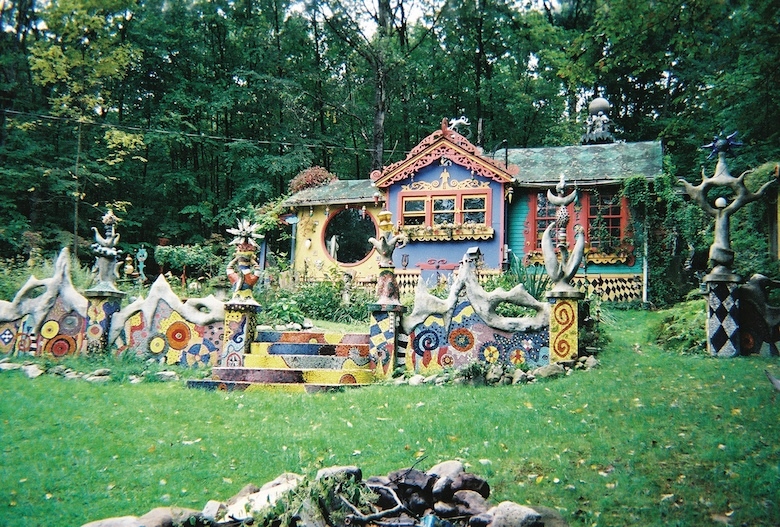 Artist, designer and “King-o-Luna,” Ricky Boscarino, has transformed the house both inside and out, with the interior of the house covered in his collections of homemade lamps, bottle caps, Buddhas, taxidermy, miniatures, stringed instruments, stained glass and religious icons. A skilled artist in many mediums, among other projects, Boscarino created a four panel stained-glass mural for his bathroom depicting the journey of life from spermatozoa to skeleton. When not working on his house, Boscarino makes and sells art and jewelry (much of it miniature versions of everyday objects, though you can get a miniature fetus and enema bag in gold and silver) and throws two large parties a year in fall and spring.